I learn things the hard way and readers of this site learns things my reading our articles. That’s how the idea behind this article came up. We’re going to discuss how to remotely reboot a Nest Cam, Samsung SmartCam and a few other models of home security camera. The methods discussed within will work with almost any home security camera. So you might ask how this happened. All home security cameras have computers in them. Like practically any computer, for a variety of reasons, they get stuck. Sometimes it’s a memory issue. Other times, it’s a problem with the code. And other times, the problem is the internet itself. The symptoms of this problem are a completely non-responsive device. You can’t log into it. 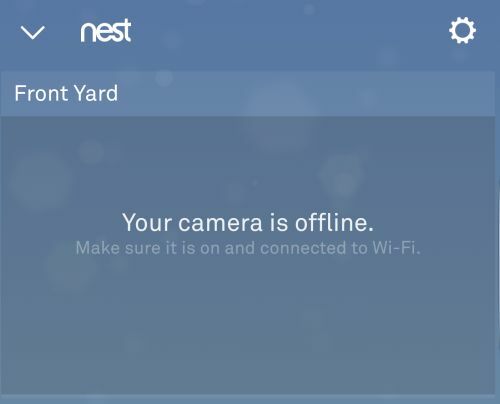 In the case of Nest or DropCam Pro, the app says the camera is offline. A Yi Home Camera or WyzeCam will display similar symptoms when it loses it’s brains. On a battery operated camera like an Arlo, you need to physically be present to open and close the battery compartment. No way to remotely reboot an Arlo. I have seen this manifest itself differently on one my Samsung SmartCam HD Pro. I was getting motion alerts every 30 seconds. As I opened the app to check the video, I received a message stating the video couldn’t be accessed. I could access the settings on the camera, but not the video. The camera needed to be rebooted. No easy if you are 1,000 miles from home which was the case. In the case of my Samsung SmartCam, I was able to get into the settings and select the Camera Default option. This option enabled me to remotely reboot the Samsung SmartCam. Unfortunately, it also reset all of my custom settings to factory mode. However, that did fix the issue. And by the way, the issue with my Samsung SmartCam was that it was pointing out a window and a bug was walking around in front of it on the outside portion of the glass. Luckily, I was able to remotely reboot the Samsung SmartCam because it only lost half of its brains. I still had access to the settings. But what if you can’t get into the settings? A method to remotely reboot your home security camera without logging into the camera is required. On a Nest Cam or DropCam Pro, a message similar to what is seen in the photo that accompanies this article means you need a way to remotely reboot the device. The WeMo Switch Smart Plug will allow us to remotely reboot any home security camera that’s plugged into it. A WeMo Switch is a remotely controlled smart plug that plugs into any A/C outlet. Your home security camera plugs directly into the WeMo Switch. The WeMo Switch is an internet controlled switch by a smartphone app. Using the WeMo smartphone app, you can turn anything plugged into it on or off. So it your Nest Cam stops working, and needs to be restarted, you can remotely reboot it using a WeMo Switch. What if the problem isn’t your camera but the cable modem or wireless router? You can use a WeMo Switch for these too. I suggest leaving a few minutes between turning it on or off, especially a cable modem. I have used the WeMo Switch for many years. When they first came out, they were a bit problematic. But over the years, through firmware upgrades, these are very reliable. One caveat I can offer it not to do a remote firmware upgrade. Wait until you are in the same physical location. Sometimes, the firmware upgrade requires unplugging and then plugging it in again (I learned that the hard way). There are other internet controlled switches out there. The TP-Link Smart Plug works similarly to the WeMo. I haven’t used these but have read the setup is a bit easier. Perhaps the only thing worse than a home security camera that gets stuck is one that requires a restart when you aren’t at home. Using these suggestions should save you from making an emergency trip to reboot the camera.